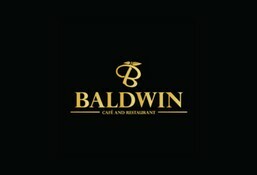 Baldwin Cafe & Restaurant is currently closed for delivery and it will open at . Eggplant, broccoli, capsicum, mushrooms, Onion, mozzarella cheese. Grilled chicken, potato, mushrooms, onion, broccoli, mozzarella cheese. Smoked salmon, capers, onion, spinach, emmental cheese. Grilled chicken, mash potato, grilled vegetables. Hamour, mash potato, and steamed vegetables. Pink salmon, french fries, salad. Beef tenderloin cooked with mushrooms, capsicum, rice, salad. Beef steak, asparagus, sweet corn, fries. Beef steak, fries, grilled vegetables. Shish tawooq, fries, salad, bread. Lamb ribs, fries, salad, bread. Shish tawooq, kebab, ribs, rice, french fries, salad, bread. Egg, bacon, parmesan cheese, cream. Panini bread, chopped lettuce, hotdog, tomato, jalapeno, mustard, ketchup. Ciabatta bread, rocket leaves, mozzarella buffalo cheese, tomato, pesto `sauce. Square brown bread, smoked turkey, mixed lettuce, tomato, jalapeno, melted blue cheese. White Panini, iceberg lettuce, grilled chicken, tomato, avocado, Emmental cheese, pickles, mayonnaise. Beef patty , lettuce, tomato, onion, jalapeno, cheddar cheese, coleslaw. Chicken patty, lettuce, tomato, tartar mix, cheddar cheese. Smoked turkey, mixed lettuce, cherry tomato, cucumber, black olives, blue cheese. Dressed with homemade italian dressing. Tomato, cucumber, bell pepper, onion, black olives, feta cheese. Dressed with lemon juice & olive oil. Buffalo cheese, rocket leaves, chopped tomato, sweet basil, pesto sauce. Dressed with reduced balsamic vinerga & olive oil. Tuna, mixed lettuce, onion rings, boiled egg, potato, capers, black olives, corn. Dressed with lemon dressing. Smoked salmon, mixed lettuce, capers, sliced lemon tossed with onion rings, black olives. Dressed with olive oil & lemon juice. 2 poached eggs, with turkey and smoked salmon served with green salad. Eggs, beef bacon, hotdog, mushroom, grilled tomato, toasted bread. Egg omelette with cheese, garlic bread, hash brown, chicken sausage. Falafel, hummus, fried halloumi cheese, labneh, olives, Arabic bread. 3 eggs with mushroom, onion, capers, capsicum, bacon, tomato served with toasted bread. Maple syrup ,honey, butter and strawberry Jam, strawberry and chocolate, nutella banana. Hazelnut syrup, Irish cream syrup, milk, espresso. Hazelnut and caramel syrups, milk, espresso. Chocolate, hazelnut syrup, milk, espresso.